Rediff.com » Cricket » Harbhajan is man of the match for his batting! Harbhajan is man of the match for his batting! Even in his wildest dreams, off-spinner Harbhajan Singh might have never imagined that he would be named man of the match in a Test match for his batting. The impossible happened in the first Test against New Zealand in Ahmedabad, when Harbhajan scored his maiden century to help India escape with a draw on the final day, on Monday. "I never dreamt of it. 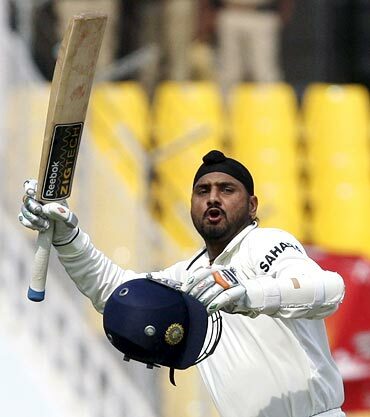 It feels fantastic to get my first hundred," Harbhajan said after the match. "I have not batted for such a long time in any form of the game. I never thought that I would get a century in Tests, maybe I thought I could get it in One-Dayers." Harbhajan showed great composure to score 115 in the second innings to rescue India after they were struggling at 65 for six at one stage. He added 163 runs for the seventh wicket with VVS Laxman, who once again came to the rescue with a fighting knock of 91 before he was unfortunately ruled out leg before wicket off an inside edge. In the first innings too, Harbhajan had rallied the Indian team with a brisk 69 from 97 balls to help them recover from a middle order collapse and take them to a huge 487. The 30-year-old paid tribute to Laxman, saying his century was only because of the support from the Hyderabadi batting genius. 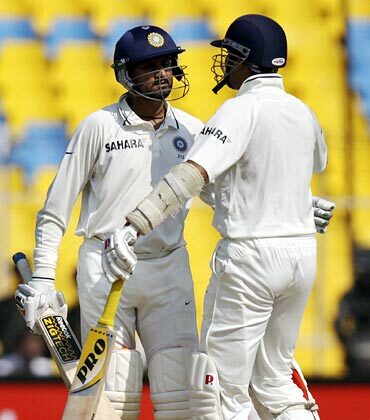 "I think I got my century because of Laxman. It was nice to have him on the other end because he gave me a lot of confidence. If not for him, I would have played a silly shot and got out earlier. I also want to thank Sachin [Tendulkar], [Virender] Sehwag and all my well wishes. My captain [Mahendra Singh Dhoni] was telling me from a long time that I have the capability to score a century. So this century belongs to all my team-mates," said the off-spinner. "Sachin always used to tell me that I have the capability to get a hundred if don't throw my wicket away by playing shots. He told me that if I play according to the merit of the ball instead of trying to hit every ball, I could get a century," Harbhajan added. Harbhajan revealed that in the second innings he curbed his natural instinct of going for his shots and looked to stay in the middle to help his team save the match in the company of Laxman. "I decided to bat normally and not play any fancy shots. I enjoyed my batting. At one stage, I felt that we were out of the game, because we lost many wickets in a session so I was just thinking that I need to stay there with Laxman." The off-spinner, who struggled with the ball, is hoping to bounce back in the second Test with a bagful of wickets. Harbhajan took one for 112 in 43 in the first innings and struggled to make an impression as the Kiwis posted a huge first innings total of 459. "I hope in the next match I can do well with the ball too by taking a few wickets," he said.